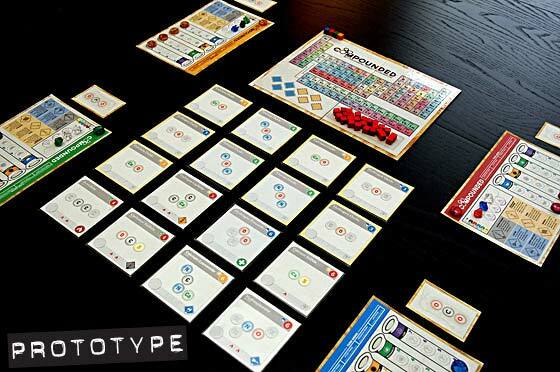 In Compounded, players take on the roles of lab managers, hastily competing to complete the most compounds before they are finished by others – or destroyed in an explosion. Some compounds are flammable and will grow more and more volatile over time; take too long to gather the necessary elements for those compounds and a lot of hard work will soon be scattered across the lab. The unboxing: Beautiful components! A bag of multicolored crystalline “elements,” large stat-tracking cards acting as lab tables, a scoring track that’s a periodic table, a stack of square “compound” cards, and assorted tokens for special items and the inevitable lab fires. The pieces could all be about 20% bigger, but it makes for a compact box I can easily throw in my bag. Also, the colors of the components are muted and calming. I know that’s kinda odd to say but I recently bought Nexus Ops (which has a fit inducing color scheme) so I thought it was worth mentioning. A simplified breakdown of play: There is a 4×4 field of “compound” cards on the table. The goal is to draw and or trade for the right elements you need to complete compounds and thus gain points. The phases are 1) draw elements from the bag and trade if you want, 2) claim compounds in the field, 3) add elements to compounds, and 4) score compounds. Easy! Easier than being a lord of Waterdeep. There are also lab tools you can earn that give you special abilities; and as you complete more compounds you can “level up,” which lets you draw more elements in a turn, or place more elements in a turn, or claim more compounds in a turn, etc. Oh! and also there are lab fires (think Pandemic‘s outbreak cards or Forbidden Island‘s water level cards) that turn up, unintentionally and intentionally! My first few plays: Learning the game from the rule book was…okay. What helped me the most was seeing it played on a video from Dice Hate Me Games’s site: linked here. Teaching Compounded is an absolute breeze. It takes about 3-4 turns to get the flow and after that it’s a piece of sulfur cake. The majority of the times I’ve played have been with two players, and I’m pleased to tell you that this is a great two-player game (and a great couples game). A dummy board is included to open up trading options, and it gives the other players a common “enemy.” Sure you’re still playing against each other but as long as Nobel (the dummy) doesn’t win you’ll both be happy. The more players you add the more interaction there is, especially when you are trading elements. Thankfully the turns go by quickly enough that even with five players there isn’t too much downtime. Was Compounded worth it to me? Absolutely! It’s a unique game that’s easy to pick up and which may appeal to your friends who more grounded in reality than you. (This was certainly the case with me.) I found my copy at my FLGS but from what I’ve read it’s been sort of rare recently. Fortunately for you there is a kickstarter starting up as soon as August 1st (Thanks for the head’s up, @paladin!). Family Gamers: Yes! It’s got a unique theme that is easy to learn, and that has all sorts of educational opportunities. Social Gamers: Maybe. There is player interaction but it’s limited to one phase per turn…and whenever someone lights someone else’s compound on fire. For us it’s enough player interaction to keep everyone talking and laughing for the length of the game. Casual Gamers: Yes! Easy to learn and easy to teach. It wraps up in about 40 to 45 minutes and you can get on with life. Avid Gamers: Yes! Unique and perfectly applied theme. You know you have a friend out there that would join your game group if only there were a little less mythril and a little more molybdenum. Power Gamers: No! Too simple and unpredictable (random element draw and lab fires). But hey, it’s science, and science will not be micromanaged! When I bring this game out to a group of new players, the first thing that always happens is they all groan and say “I flunked chemistry”. I have to explain to them that it doesn’t matter, all they have to do is put tokens on colored spots. That would be the “downside” to this game. Once you convince them to play however, it is a great deep game, that works great for any group of 2-5 players. The basic premise of the game is to place little gems (elements) on different compounds to “complete” them, and add them to your lab. Elements are received each round through a blind-draw mechanism. As you complete more compounds, you level up, and gain the ability to work on more compounds at a time, place more elements, and draw more from the bag. This game requires a decent amount of strategy to play. You need to pay attention to turn order, look at what elements other players have currently in their lab, and look at where elements are on the board. One of the more exciting aspects of the game is the lab fire. Every so often, a lab fire occurs, which causes certain flammable compounds to explode. These compounds then spray the elements outwards onto neighboring compounds, and are replaced from the deck. This means you have to pay attention to the compounds you are working on, to make sure you can finish them before a fire occurs. You can also cause lab fires, to keep your opponents from finishing a compound. Very fun to play, deep gameplay, lots of replayability. The mechanic of the game is unique. Cards are an odd size, and there are no sleeves for them that I have found. Gems are colored, and would be unplayable for the color-blind. The turn order is a little complex, and requires a bit of explanation for a first time player. Once you’ve played though, it’s easy to understand. Chemistry theme scares off players sometimes. This game works very well with two players. It comes with a special “third player AI” card, that automatically places elements onto the board when playing with two. I have played two player games both with, and without this card, and it seems to be fun either way. I highly recommend this game for couples. Overall, this is one of my favorite games. It is always in my “bring” bag when I head to my weekly games night at the store. I have yet to have anyone say they wouldn’t play it again. The score board being the periodic table of the elements is a great hook, and just makes the game a pleasure to lay out. General: A nice step up into “heavier” gaming for the casual gamer. Plays with a mix of luck and strategy. No science background needed. Game board and pieces: Each player gets a “work bench” to store their elements, keep track of experiment levels, and hold tools they have earned. The compound cards are an odd square-ish size, but nice thickness and should hold up well over many plays. The elements are small odd-sided plastic pieces in five colors: clear, yellow, blue, green, red, and black. FYI – they don’t feel very good if stepped on with bare feet; not Lego level pain, but discomfort nonetheless. There is also a scoring board that uses the periodic table of elements to keep track of your points. Set up: Compound cards are dealt out onto the field, the remaining are stacked with lab fires spaced throughout. Playing Mechanism: Players take turns drawing elements in an attempt to fill compound cards to gain points and level up experiments on their work bench, expand their lab abilities and become the reigning King of the Lab! Watch out for lab fires and exploding compounds. The game relies on both luck and strategy. Elements are collected through blind draws, but earned abilities can allow you to keep one from a completed compound, and gaining the ability to draw and retain more elements through leveling up. Expansion: Not at the time of this writing, but I believe one is in development. Pros: I love the theme! I don’t think there are enough science themed games. Also, I am extremely grateful that the designers included a mechanism to allow for two player play. Cons: Many of the game components are quite small. Also, color discernment is necessary to play, the element pieces are only distinguishable by color. My color-blind gamer is able to play, but has a problem telling two of the element colors apart unless they are side by side. There is a learning curve, so be sure your gamer friends have their patience when breaking this one out the first few times. Overall thoughts: I really like this game and could play it every day. It is my first choice when asked what I want to play. The rest of my small gaming circle prefer games a bit lighter, but do not groan when I suggest it. Beautifully appointed and heavily themed, Compounded is a game about chemical research in which scientists attempt to create as many Compounds as possible whilst avoiding the possibility of lab explosions! For two to five scientists aged thirteen and up, it is a set collecting and trading game that can played through in roughly ninety minutes..
Compounded’s theme starts with its components. The first is the Scoring Board, which is done as a Periodic Table. Perhaps a bit fiddly in use once everyone’s scoring counter is on the scoring track, but thematically, it is perfect. Second is its decently written Rulebook, which looks like a scuffed and battered chemistry school textbook. The third are the scientists’ Work Benches. These have spaces for each scientist’s Element Storage Area, Lab Tools gained, and to track the progress of his Discovery, Study, Research, and Lab experiments. Each Experiment can be improved by completing certain Compounds. Fourth are the game’s Compounds, such as Calcium Oxide, Acetylene, Nitric Acid, and Methanol. Each Compound is a square card marked with a name, its chemical formula, spaces for the elements it is comprised of, a spot to place a Claim token, and a scoring value—the latter ranging between three and eight Atomic Points. Others also have icons that grant Lab Tools and improvements to a scientist’s Discovery, Study, Research, or Lab experiments when the Compound is completed. Some also have icons indicating that they are flammable and could explode. Fifth are Compounded’s Lab Key—a wooden key used to determine scientist order and various Lab Tool tokens—Bunsen Burners, Graduated Cylinders, Lab Keys, Pipettes, Safety Goggles, and Journals. Sixth, and lastly, there are the game’s Elements—in ascending order of rarity—Hydrogen, Carbon, Oxygen, Nitrogen, Calcium, and Sulfur (sic). These are represented by coloured chips of plastic. Again, pleasing on the eye and nicely tactile. At game start, each scientist receives a Work Bench, the wooden tokens to indicate his progress on the Bench, and a Fire Extinguisher card. If this is filled, it can be used to stop a Lab Fire or saved until the end of the game for more Atomic Points. He also receives a Wild Element that can be used or turned in for Atomic Points and also his initial allotment of Elements. Then, sixteen Compound cards are laid out in a four-by-four grid Research Grid. Initially, these will include the yellow-bordered starting Compounds. The Compound deck is seeded with Lab Fire cards. 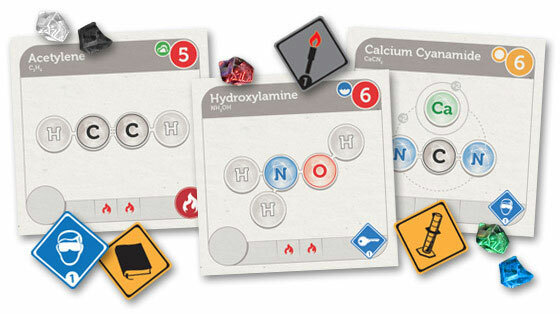 Compounded is played in four phases—Discovery, Study, Research, and Lab. In the Discovery phases draws Elements from the black cloth bag included in the game. Initially, each scientist can only draw two Elements and can only store four Elements in his Element Storage Area, but both can be increased by three. Once Elements have been drawn, scientists are free to trade Elements—as well as Lab Tools, promises, and so on. In the Study phase, each scientist can use his Action tokens to claim Compounds. Once a scientist has claimed a Compound, no other scientist can score from it. Initially a scientist has only the one Action token, but completing Compounds can increase this number to four. During the Research phase, the scientists take turns placing Elements on their claimed and unclaimed Compounds, each Element being placed on an appropriate space marked on a Compound card. Initially just two, but it can be increased to six. If a scientist does not have the Elements he wants, he can now trade in three of one type for one he wants. Lastly, during the Lab phase, scientists score Atomic Points for completed Compounds on the Periodic Table and adjust their Experiments if the completed Compounds help improve them. Completed Compounds are replaced from the Compound deck. If a Lab Fire is drawn, Flame Tokens are added to any flammable Compounds with empty Flame icons on them—typically no more than two per Compound. Enough Flame Tokens and a flammable Compound explodes. It is removed from the game and its Elements are scattered onto empty spots on adjacent Compounds—if they have space for that type of Element. A game of Compounded ends with one final round once a scientist has either scored fifty Atomic Points or completed three out of four of his Experiments. The game ends immediately if the Compounds in the Research Grid cannot be refreshed to a maximum of sixteen. The scientist with the most Atomic Points is the winner. This is for the three to four player standard version of Compounded. A variant adds ‘Lab Partners’ Compounds, double-sized complex Compounds requiring more Elements. Intended to be completed by two scientists, they will both receive the Atomic Points and its benefits for completing it. A two-player variant adds a third ‘dummy’ player named Nobel, his actions being controlled by the lead scientist. Thematically wonderful, Compounded suffers from small text and small tokens—particularly the wooden Experiment tokens and the Flame Tokens. Nor are the phases—Discovery, Study, Research, and Lab—as obviously named as they could be. In game terms, they are ‘draw Elements’ (Discovery), ‘claim Compounds’ (Study), ‘place Elements’ (Research), and ‘score Compounds and effects’ (Lab), but this is not all that clear on the Lab Benches. Compounded is not a complex game—in fact anyone who has played Ticket to Ride or Pandemic will understand its rules and play, its complexity being light-medium rather than medium. The game is also informative, educating players about the nature of the research process and the atomical content of the game’s compounds. Beyond drawing Elements and new Compound cards, the game has no randomness, though Lab Fires can upset many a scientist’s aim of completing particular Compounds. Compounded’s chemical theme is quite gentle, which when combined with its mechanics, makes the game unthreatening in terms of play. Although Compounded’s theme might be said to be rather dry, it is not ‘pasted on’; rather Compounded fully engages in its chemical theme to create a relatively light and appealing reaction. 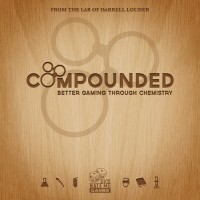 Add a Review for "Compounded"